Black Press reporter Natalie North rapels downs the Standard Life building at 1175 Douglas St. in 2012. North was one of the brave participating in the B.C. Lions Drop Zone taking the plunge down 13 stories to help to raise money for B.C. 's children with disabilities. 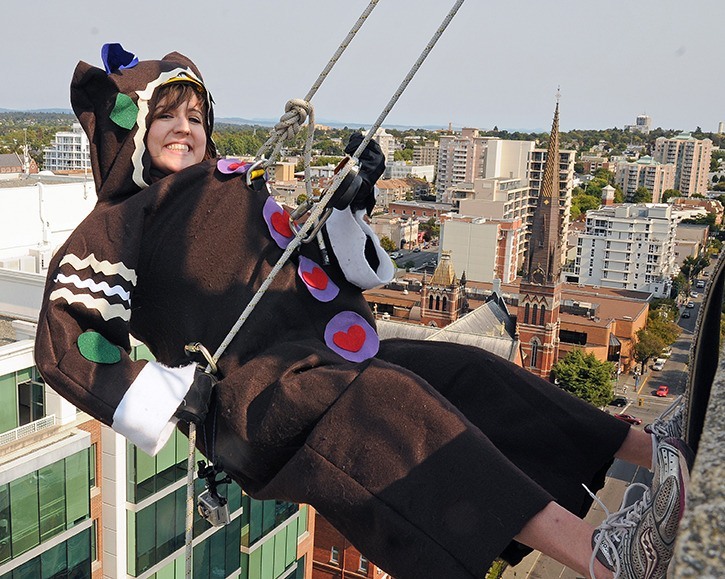 The days of costumed mascots and Greater Victoria mayors awkwardly rappelling down the side of a downtown Victoria office building are no more. Standard Life, which for the past seven years has hosted the Easter Seals Drop Zone for the Kids event at its 1175 Douglas St. building, told Easter Seals in 2012 that last year’s event would be its last, said Standard Life spokesperson Anne-Julie Gratton. Verna Wright, Easter Seals special events co-ordinator, announced this week the Drop Zone fundraiser is now indefinitely cancelled. Drop Zone raised $113,000 last September for Camp Shawnigan, a summer camp for children with mental, cognitive or physical disabilities. Easter Seals sends 300 kids through the week-long camp each summer at a cost of $2,400 per child. Wright said Easter Seals approached several other building owners in Greater Victoria but were unable to secure a new location for the rappelling event. “We have other events, and we’re hoping they’ll be able to make enough money to keep supporting the camp. We can’t close it,” she said. Upcoming Easter Seals fundraisers include the second annual Splash of Colour Family Fun Run for the Kids, Apr. 19 at Royal Roads University. The five-kilometre run includes bright-coloured paint explosions throughout the race. See splashofcolor.ca for more information. On May 31 and June 1, the Easter Seals 24-Hour Relay for the Kids takes place at University of Victoria Centennial Stadium. Visit 24hourrelay.com for more. Vancouver’s Drop Zone event will still take place this year, and Wright said interested participants are still invited to attend. Editor’s note: A previous version of this story incorrectly referred to Standard Life building management.